It is amazing to think what human ambition is truly capable of; particularly turning something of great adversity into one of hope, change agent none the less. If you had asked many people a few years ago what a drone was, don’t be surprised if the responses were aligned to a killing machine. The use of remotely piloted aircraft, otherwise known as drones, were largely engaged in what became known as “targeted killing”. Imagine, a faceless person stationed thousands of miles away, with a perpetual ability to launch strike anywhere, and anytime. Many considered this a nightmare, and rightly so. Fast forward to today, and you will be stunned by how this very symbol of destruction has become a beacon of hope in several developing countries. Figure 1: A PPP with Rwanda government sees a parachute dropping much needed supplies. Ingenious companies and start-ups are utilising the drone’s ability to be anywhere at anytime to reach remote areas, helping those most in need. Imagine a pregnant woman in an isolated community in a developing country, in need of vital blood transfusion to save the life of both herself and her unborn child. The nearest major hospital is hundreds of kilometers away and yet; the midwife is able to remain calm. Although this situation rightly presents a sense of urgency, you might wonder why there is no panic among the clinicians. This is a challenge faced by many in developing countries however, the possibility that the much needed life saving blood is merely a few minutes away; via drone provides some relief. A robotics start-up has been impressive in its partnership with the Rwandan government – delivering medical supplies to hospitals and blood transfusion centers using their specially designed delivery drones. With speeds of 100km/h, serving 21 hospitals across Western Rwanda providing instant access to supplies for over 8 million people, this innovative approach is saving many lives. Where traditional means of transport might take hours, this new logistical approach takes minutes and in worst cases, only up to 30 minutes, to reach its intended destination and recipients. In Malawi, a government partnership with UNICEF is proving successful in the fight against cholera. An outbreak in November 2017, that quickly spread to six districts and a reported 340 cases was the motivation to take a pioneering approach to fighting the disease. Scientists use drones in mapping out densely populated and high-risk areas in the capital to provide clinicians with data to allow effective strategy and intervention implementations to help stop the spread of the disease. Drones are also used in delivering HIV test kits to remote parts of the country. 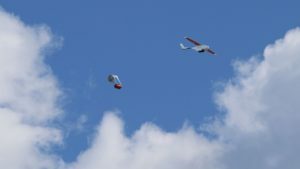 With such great results, it is little wonder that Tanzania is following suit in the use of drones to save lives via delivery of essential medical supplies – this follows an announcement in early 2018. Starting with four distribution centers, providing more than 100 drones and 2,000 flights a day, this is by far the biggest commitment by any country in the world today, eclipsing Rwanda which has already completed 1,400 deliveries since 2016. The use of drones in Africa are by no means restricted to the health sector. With countries such as Ghana and Nigeria opting to find solutions to food security, data-collecting drones and mapping tools are playing an integral part in farm tech, allowing for upgrading and improvements to be made in crop care. The international EU-funded development organization, Technical Centre for Agricultural and Rural Cooperation (CTA) has focused on the huge potential for agricultural drones in Africa. Turning to a French start-up, the objective is to help farmers map their fields and pinpoint problems with crops. By having accurate data on their terrain, farmers will be better equipped to implement more effective farming practices that will increase yields. Low crop yields in sub-Saharan Africa lead to a partnership between non-profit organisations to launch a two-year, $1.6 million initiative to develop more impactful, cost-effective tools. Among them, was utilizing drones to boost agricultural productivity. Using Geospatial technology, data generated from drones help small farmer better plan and manage their inputs, the outputs being better yields which have a downstream effect in poverty reduction. The transport sector also provides enormous opportunity for risk-takers to explore. A huge infrastructural deficit in many sub-Saharan countries means lack of transportable roads, leaving many of its population without access. A new type of autonomous logistics introduced by a South African start-up aims to overcome this challenge. A mere look at the ecosystem indicates that those brave enough to invest in Africa will reap vast rewards. What makes governmental partnerships with private sector businesses successful in Africa is that African countries are more open and accepting to innovation whereas such start-ups in developed countries struggle with strict regulations. The virtual free reign to “fly in the sky” has opened the continent up to be leaps and bounds ahead of many developed nations. Impressive and welcomed as it is in solving many of Africa’s challenges, perhaps, now is the time to put up frameworks that will guide the proper use of these technologies to monitor usage and avert human privacy breaches from unscrupulous entities.